As Bombay can't hold more people, the lack of space and development has forced builders to look for greener pastures. Karjat seems to be the choicest location for builders, with the MMRDA's big plans for the city. One firm, Matheran Realty, is focusing on creating ultra low-cost housing in Karjat. Situated just 90km east of Mumbai, its a viable option for many people especially when it comes to the price factor. Their project named Tanaji Malusare City, is India’s first social housing project, is spread across 100 acres. They intend to build 15,000 flats with prices starting at a little over Rs 2 lakhs for a 19 square-metre apartment. Milind Mhaiskar, metropolitan commissioner, said, "There is a huge requirement for low cost accomodation and a desire among people for affordable houses. People do not seem to mind even if they are far from Mumbai city. We are confident of good response to projects in Vasai, Karjat, Kalyan, and Thane." 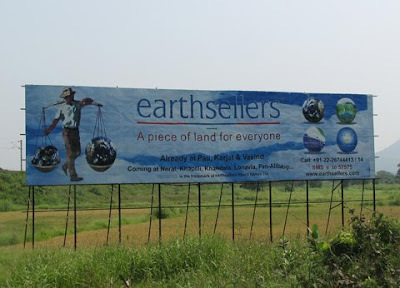 Real estate in Karjat is a big business, if you have recently visited Karjat you would see hoardings and billboards all along the road advertising property sales and farm house sales. But Karjat is not only catering to the low cost flat owners. Corporations like the Big Studio are also seeing Karjat as a viable option. With development slowly catching up in Karjat one can only wonder, how long will Karjat be a green getaway for nature lovers in Mumbai.